Over the past two decades, dental implants have become the standard of care for replacing missing teeth. Why the relatively sudden growth in popularity after hundreds of years with just dentures and bridges? Dental implants are unique because they are the only treatment that replaces an entire tooth-- both the crown that is seen in the smile as well as the root below. The end result is a prosthetic that is built just like a natural tooth, so it looks, acts, and even feels like a real one as well. A single implant can be paired with an all-ceramic dental crown for a virtually seamless replacement. Because of the crown’s conservative nature, it will be able to fit in right alongside natural teeth without requiring them to be significantly altered or reduced. Its metal-free structure will also reflect light in the same way as natural tooth enamel, which means that you may even forgot it’s not natural after some time has passed. 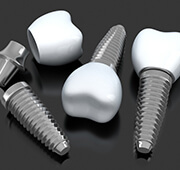 Meanwhile, the placed dental implant will provide reliable support for many years to come. If several natural teeth have been lost, there are multiple options available for dental implant replacement. Implant-retained dental crowns are a viable option, but consecutive missing teeth that once appeared in a row can also be replenished with a custom-made dental bridge. 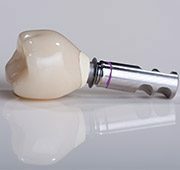 This prosthetic will be anchored in place securely with the help of two dental implants, which are surgically placed on either side of the gap. This modern style of reconstruction is much more successful than traditional bridges, which require healthy teeth to be filed down to accommodate dental crowns. Are You Missing All Of Your Teeth? Contrary to popular belief, even patients who have lost a large amount of natural teeth can be good candidates for dental implant reconstruction in most cases. 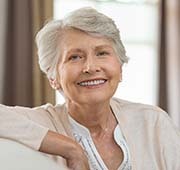 Our Salem doctors can design a customized full or partial imlant denture that attaches over a few strategically anchored implants, providing plenty of long-lasting quality at a cost-effective price. 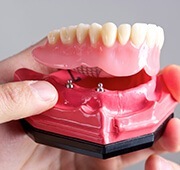 These dentures can be permanently anchored in place or kept removable like a traditional denture – this choice will depend on the patient’s own preferences and their current level of oral health. We strongly encourage patients to schedule a dental implant consultation so that we can assess their specific condition and walk them through the stages of this transformative process more clearly. Every situation is different, and our team cannot provide an accurate cost estimate until we have this information in hand. While dental implants are certainly not the cheapest option available today for tooth replacement, we assure you that the lifelong benefits, aesthetics, and durability they provide are more than worth the initial investment. 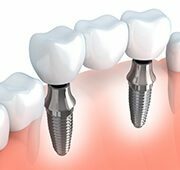 Cochell Family Dentistry is happy to restore dental implants right here in Salem, whether a patient is missing one tooth, multiple teeth, or even an entire arch. We’re also able to offer a procedure known as All-on-4, in which an entire row of teeth can be replaced with a strong implant-retained denture in just one day. In other words, if you’re ready to finally say “goodbye!” to heavily decayed, loose or broken teeth in your smile, dental implants may be for you. You can get them restored right here in Salem at Cochell Family Dentistry. To learn more about this treatment and schedule an initial consultation, contact us today.